Free career tests are previews of career personality, career interest, and career aptitude tests offered by career test providers. They report a small part of your career evaluations as a teaser for more comprehensive test reports. How do you separate good career quizzes from the bad ones? Just take several free online career tests — if possible, take all the tests in one sitting. With minimal information, free occupation tests are still useful for probing the career evaluations. This is especially true when the reports confirm your knowledge about yourself. Free career tests are light and fun career quizzes that you can take anytime you want. But don’t underestimate the results. Be honest when taking the quizzes and you won’t discover many surprises in the reports. You can take one test on more than one occasion to check the accuracy of the results. Also, you want to take different career tests to check the consistency of your career profiles and the suggested career choices. Free career assessments can give fair amounts of “meat” in their free test reports. When you are starting to see patterns, which are accurate and consistent, from the free career tests you have taken you want to buy the paid career tests to get more comprehensive reports. Taking paid career tests and getting their comprehensive reports will boost your confidence in selecting your new career. Here you’ll find many types of free career finder tests. They cover several career quizzes for different inventories. Which type of characteristic do you want to base your career change? Is it your work personality, occupation interest, job aptitude, career values or may be all mentioned combination of inventories? Take one test or two and learn the ones that are suitable to your situation or career objectives. 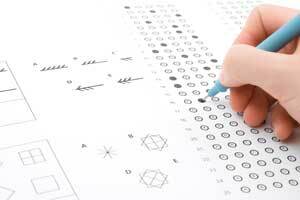 Free career aptitude tests will help you prepare your prospective employer’s screening test. A free career personality test provides an overview on your personality profile at work. Free career interest tests check your liking or preference to certain work activities. Free career assessment tests will help find out your source of satisfaction and what values motivate you. Although online job seekers use diverse keywords for searching: free career placement test, free career planning, free career choice test, free career guidance test, or even free online career tests — the above tests have covered all general types of career tests. The O*Net Interest Profiler is a reliable interest-based assessment tool you can use to find your work interests. It can help you find your work-related interests, focus career search activities and enable you to link the interests to O*NET-SOC occupations. You don’t have to go to another site to take the test. Just click the button below to start your test. Similarminds offers a fun free career quiz. There are 30 questions related to personal preference, personal expression and reaction to a stressful situation. I also found questions about opinion related to personal habits, life’s values and relationship with others. Each question requires you to pick 1 out of 5 choices ranging from “very inaccurate” to “very accurate”. At the top of the test there is an instruction for you to give an honest answer that represent your “true self” and not to select your “ideal self”. For this reason you may want to check the results’ accuracy by taking the test on more than one occasion. I took the test in one sitting. 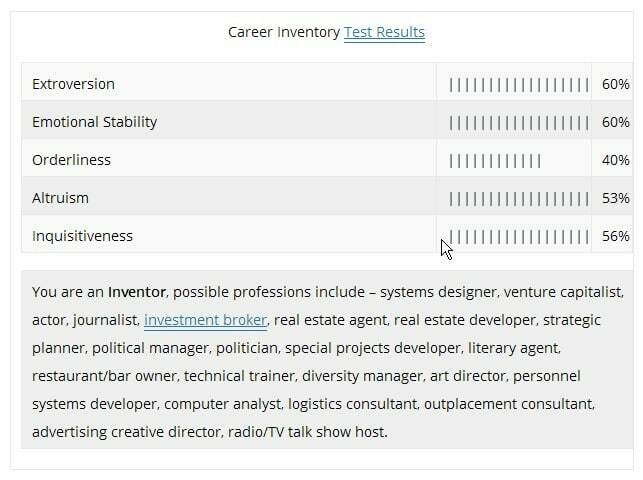 The results of SimilarMinds career test show percentages of 5 inventories and suggest suitable careers related to the profile. I can see my career pattern when comparing the results with many paid tests that I took before this one.